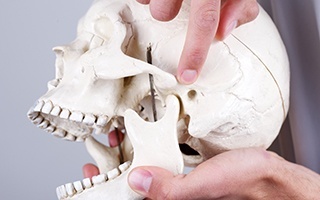 Temporomandibular Joint Disorder can occur when the bite is out of alignment and there is an excessive amount of stress or pressure on certain parts of the jaw. If you have been diagnosed with TMD or are experiencing TMD symptoms, your best treatment option may be to wear a nightguard that reduces pressure on the teeth while sleeping. In addition to TMJ therapy, Harbor East Dental may also recommend making some lifestyle changes to reduce teeth clenching habits and reduce tension in the jaw. TMD can manifest with a wide range of symptoms, including a stiff or painful jaw, chronic headaches, earaches, and even neck pain! It’s amazing what all can stem just from your jaw. When you come to see us, we’ll check on the health of your TMJ by testing its range of motion and looking for any signs that you might be grinding your teeth. If we find anything, we can recommend a variety of treatments to help you get the relief you need. Can Bite Adjustment Reduce My Jaw Pain? Sometimes, a misaligned bite caused by TMD can cause the teeth to come together unevenly, placing a tremendous amount of pressure on very small areas of enamel. This can cause the teeth to actually shift within their sockets, which can be quite painful. To correct this, we will recommend occlusal splint therapy. Next, we can perform something called an equilibration/occlusal adjustment. Simply put, we’ll use a dental impression to find these high-pressure areas, and then we’ll gently shape your teeth for that your bite comes together smoothly and painlessly. If large amounts of tooth structure need to be removed, we will recommend tooth alignment with Invisalign. What are alternative TMD treatments? An occlusal splint is another approach we can take with your TMD treatment. It is an orthotic oral appliance, and it works by slightly shifting the jaw so that the muscles are in a much more natural and relaxed position that allows them to heal. Each occlusal splint is custom-made for every patient so that it comfortably fits over the teeth and provides optimum results. A patient will only need to wear the splint to bed each night, and it has the added benefit of providing a protective layer between the teeth in order to prevent damage from grinding. 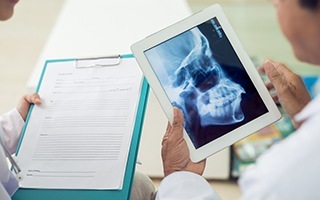 After wearing the splint for a few months, the jaw should be able to reorient itself into its new position on its own, and the patient will be able to stop wearing it. However, some patients will need to continue wearing it in order to see consistent results. If you’re dealing with chronic jaw pain, headaches, or if your teeth are worn down from grinding, you very well could have TMD. This is a problem many people face but are not aware of, so if you’re dealing with any of the symptoms we have mentioned here, be sure to reach out to us for help. We can give you the relief you need so you can live a pain-free life. To learn more and start getting treatment, simply contact us today.